It’s 1925 Missouri, and Prohibition is in full swing. For nearly fourteen years of our history here in the United States, from 1920-1933, the manufacture, sale, and transportation of liquor was, by constitutional amendment, a criminal offense. But that didn’t stop folks from manufacturing, selling, and transporting liquor. In fact, the manufacture, sale and transportation of liquor was a booming business – underground, in city speakeasies. In caves, in the backwoods, in the hollows. When I researched the manufacture of whiskey – or moonshine – for a subplot of my book Whistle in the Dark, I was charmed by the language of the liquor, the music of the mash, the whiskey words. Call it squirrel whiskey, stagger soup, tonsil varnish, ‘shine. Call it sweet-spirit- of-cats-a-fighting. The whiskey was sold in secret—at the bell-tree, the speakeasy, the back of the Model T Ford. And for those who took too much of the too strong stuff? Well they were leathered, jugged, tangle-footed, trucked, trousered and wiggity-whacked. Tub-thumped. Say it five times, fast. 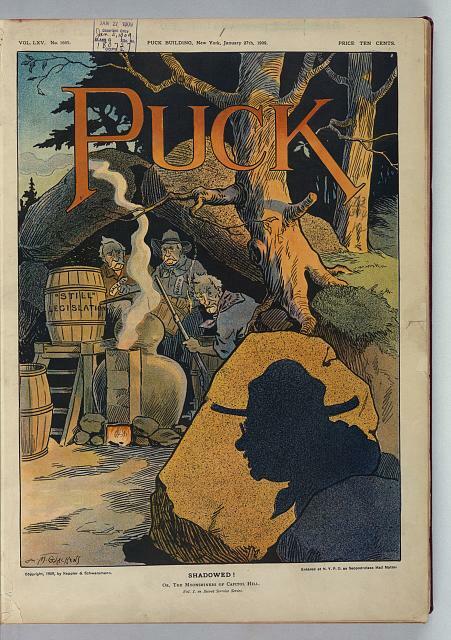 Clem, in the book, is just thirteen, but he works down the deep dark, in the lead mines, like his Pap and Grampy, who’s sick with miner’s consumption. The men and boys have their own language for the work, and that, too, has its own particular beat. Adit, sledge, clean-and-change, mucker, grinder, hoisterman, cage. Carbide, cap-lamp, hip flask. And there’s the miner’s greeting, Glückauf—good luck!—and at end of day, they say To grass. To grass! For Clem, the phrase uttered by the miners as they end their shift each day holds such a longing! For the air and the sun, for growing things and living things, for change. It’s hope. It’s lovely thing to say, I think. The dark work for now is over, and there are better things ahead. To grass! We’re always thrilled when one of our members shares a brand-new book cover, and we realized we should start interrupting our regularly scheduled programming with showy cover reveal announcements worthy of an Edwardian debutante ball. 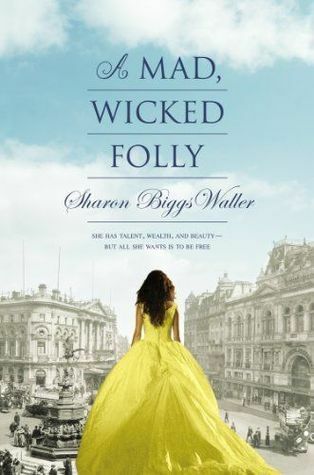 Speaking of the Edwardians, two of our members, Sharon Biggs Waller and Katherine Longshore, just had the opportunity to reveal the covers of their novels set in this opulent early-twentieth-century era. Without further ado, we formally present A Mad, Wicked Folly and Manor of Secrets. Janie Seward: Fiery, hardworking, and clever, Janie knows she can be more than just a kitchen maid. But she isn’t sure she possesses the courage—or the means—to break free and follow her passions. Both Charlotte and Janie are ready for change. 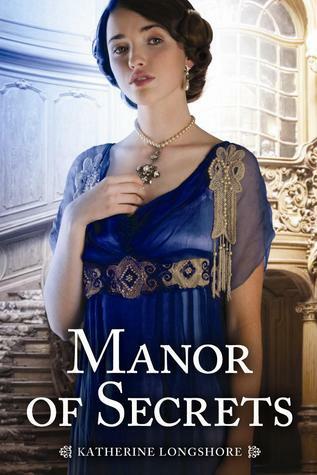 As their paths overlap in the gilded hallways and dark corridors of The Manor, rules are broken and secrets are revealed. Secrets that will alter the course of their lives…forever. World-building is a concept that’s often tossed around by writers of dystopian, science fiction and fantasy novelists. Creating a believable story setting with its own rules, history, geography, and evolution. It is, basically, becoming the god of your own little universe. It’s the same with historical fiction. Only we haveto share godliness with history. Historical fantasy gives a little more flexibility to the author god, as does alternative history. But at the end of the day, all of us have to write a world that is rich, diverse, understandable—believable. I write straight historical fiction. Recently, someone commented that I could narrow this down and say that I write biographical fiction. My characters were real. They lived real lives in real buildings through real history. How much world building is there in that? Tons. I have to approach my novels as if I am writing a completely foreign and unknown world—because in many cases, I am. I have to write for the people who come to my books knowing nothing about the Tudors—or knowing the very basics. I have to build a world the reader can submerge himself in. It’s one of the reasons I love doing what I do. These are some tricks I’ve picked up along the way, which I think apply to all story worlds—be they fantasy, sci-fi, historical or even contemporary. Know your climate. Hot, cold, windy, rainy. Does it snow? How often and how deep? Are there hurricanes? Droughts? Do people depend on the weather for sustenance? Are they barred from travel because of inclement weather? Know your rules. This applies to any and all story worlds. If you create a world where dragons don’t exist, you can’t put one in. If magic is possible, it has to be created and utilized according to strict procedures. If decisions are made by a council, so be it. If they’re made by a king, give him the power. If women are allowed to vote or speak or choose, let them. But if they’re not, it has to affect them—and the reader. Know your history. I know this seems like a no-brainer, since we are a blog that talks primarily about historical fiction. We need to know the rules, attitudes and cultural geography of our settings because that’s our world. But I think world building for all genres also requires that the author knows the past. What happens before? Were there wars that affected the decisions of the story’s present? Rulers that were admired? Decisions that were made that specifically included or excluded members of the population? And sometimes, writing historical fiction, we also need to know the future. We can foreshadow events that our characters can’t envision (such as Anne Boleyn’s eventual fall) and we can catch ourselves in accidental anachronisms (example: Despite tea time being a quintessentially English experience, the Tudors did not indulge in it—because it was introduced by Charles II’s wife, Catherine of Braganza–more than half a century after the last Tudor’s death). No matter what your genre, world building is a grand adventure. Whether your concepts come from your imagination or from historical documents, there is so much you can do to create a believable story setting, fully alive with all five senses. 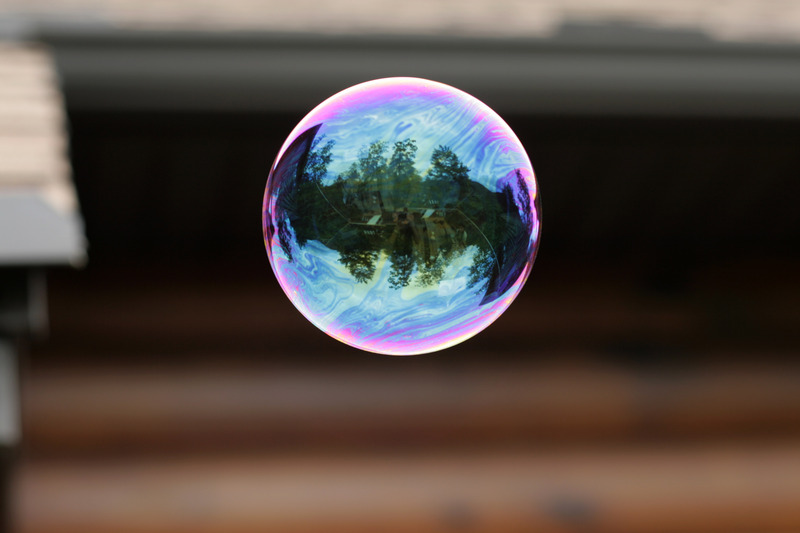 The biggest trick is to find the balance between establishing a rich story world and overwhelming the reader with too much detail. Sometimes, it’s important just for the writer to know—you don’t have to share it all, but the richness of your own knowledge will imbue your novel with life on every page. We’re continuing our 1920s week with special guest Rosanne Parry, author of Heart of a Shepherd and Second Fiddle. 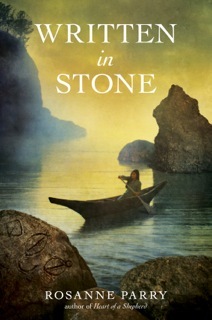 Her newest novel, Written in Stone, debuted June 25, 2013. One of the great pleasures of writing middle-grade historical fiction is introducing young readers to an historical era for the very first time. And one thing I am grateful for is the knowledge that I don’t have to say everything about a particular era because my readers will loop back to this point in history both in their high school course work and in their reading for pleasure. So I am always looking for a Young Adult book or two from the same era as my historical fiction to recommend for my readers as they grow older. 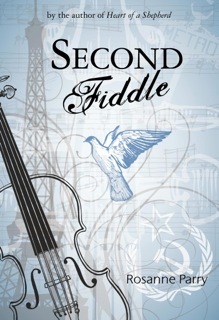 When I wrote Second Fiddle in 2011, it was one of very few books for young readers set during the Cold War. In this book I chose to mention but not dwell excessively on the cruelty of the Soviet Union. But I was delighted to find a gripping and beautifully written story about the atrocities committed by the Soviet Union in the Baltic region: Between Shades of Gray by Ruta Sepetys. It’s a grim story for children at the younger end of middle grade, but for those older readers heading into high school it’s a great way to get a fuller picture of why the KGB was so frightening to my characters and why the Soviet soldier my characters rescued would stop at nothing to prevent the girls from being caught by the KGB. My newest historical fiction, Written in Stone, is set in the early 1920s, and I believe I’ve found in Cat Winters’s YA book In the Shadow of Blackbirds a story that beautifully sets the scene for the main conflicts in my own book. On the face of it, the stories have little in common. Cat’s story is set in 1918 in San Diego at the height of the influenza epidemic and features a wealthy white teenager who is living with a widowed aunt while her father suffers an unjust imprisonment for his pacifist beliefs. While there she encounters spiritualist photographers who prey on people grieving those dead from the war or the flu by taking doctored photographs of them with the “ghosts” of their loved ones. This has little to do outwardly with a Makah girl living on her reservation on a remote corner of the Olympic Peninsula, where her family is suffering from the loss of their traditional whaling and struggling to survive both economically and culturally in a changing world. And yet the influenza epidemic and the revenges of the First World War have everything to do with the story. Olympic Peninsula. 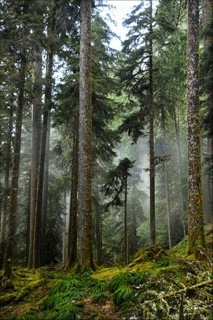 Photo by Quinault Forestry Department member Larry Workman. The influenza epidemic was as devastating in rural and remote communities as it was in the big cities. Half of Pearl’s village has died in the epidemic which occurs five years before the start of my story. Many of the Makah men who volunteered in the war did not come home. Successful traditional whaling requires an eight-man crew of highly skilled whalers, all in one extended family. 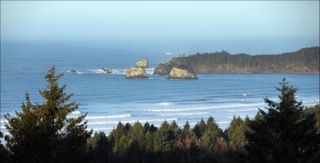 For thousands of years nearly every extended Makah clan mounted a whale hunt every year. It was a source of enormous wealth and prestige for the whalers. The combined death tolls from the war and influenza made it nearly impossible to mount a crew of able-bodied men. In addition, the naval warfare technology greatly increased the killing power of the commercial whaling fleets of Russia, Japan, and the United States. Before the war a whaling voyage might last one to three years and the ship would kill and process a few dozen whales in all that time. Larger ships and the harpoon cannon made it possible to kill dozens of whales in a day. The whale population in the Pacific plummeted in the 1920s. On top of those troubles, the rising tide of racism, which included the sweeping anti-German sentiment during the war mentioned in In the Shadow of Blackbirds, also extended to Native American communities. Indians were not even granted citizenship in this country and an opportunity to vote until 1924, and this after thousands of them volunteered for military service. In the Northwest, both Canada and the United States outlawed the practice of giving a potlatch. 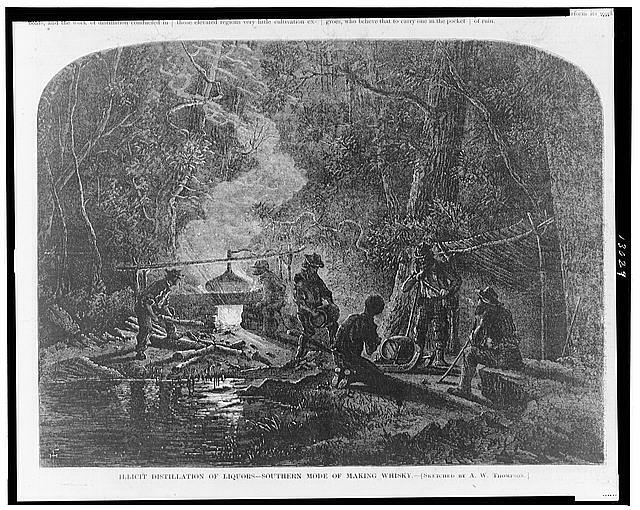 Both governments seemed to assume the potlatch was a primitive ritual preventing full assimilation of tribes into the “American” way of life. The potlatch had many purposes for the tribes who used them. The one that is of most importance to my character Pearl is their use as a memorial service. Potlatches, then, and even today, are given when a leader of a community has died. It honors the person’s life and provides for the clear distribution of that person’s property. It was also used to settle regional disputes, formalize the bonds of marriage, establish legal adoption of children, and recognize intellectual property, including art, music, dance, and stories. For people who lived in small and often isolated fishing villages it was an important way to maintain social contact and balance the wealth in a region full of economically powerful families. Many Indians in the region were imprisoned for keeping the practice of potlatching alive for their communities. I love the opportunity a book gives to open a young readers eyes to a past injustices like the outlawing of the potlatch. It’s my hope that both these stories will encourage readers to talk about past injustices and also to reflect on who is being treated unjustly today. I’m always looking for more books to recommend as a companion read to mine, so if you know of another book set in the 1920s please mention it in the comments. And if you’d like to be a part of a conversation about historical fiction and the 1920s, Cat and I and two other writers from Portland will be talking about our Gatsby-era books at A Children’s Place Bookstore, Saturday, September 14, at 2 pm. Hope to see you there! Rosanne Parry author of Heart of a Shepherd, shines a light on Native American tribes of the Pacific Northwest in the 1920s, a time of critical cultural upheaval. Pearl has always dreamed of hunting whales, just like her father. Of taking to the sea in their eight-man canoe, standing at the prow with a harpoon, and waiting for a whale to lift its barnacle-speckled head as it offers its life for the life of the tribe. But now that can never be. Pearl’s father was lost on the last hunt, and the whales hide from the great steam-powered ships carrying harpoon cannons, which harvest not one but dozens of whales from the ocean. With the whales gone, Pearl’s people, the Makah, struggle to survive as Pearl searches for ways to preserve their stories and skills. This week on the blog, we’re inviting two guest authors to give us two very different views of the 1920s. Today, we’re thrilled to welcome Teri Brown, author of Born of Illusion. 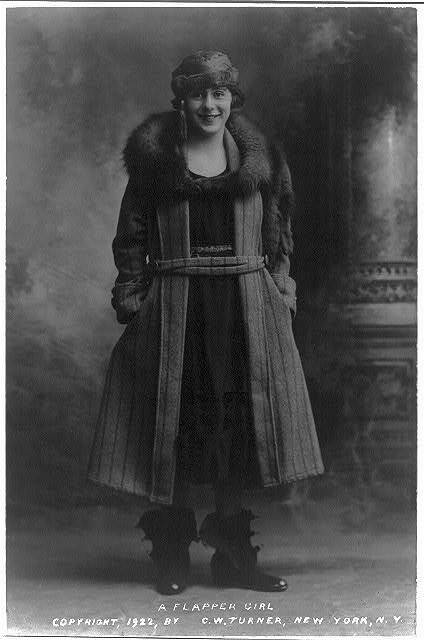 Flapper, circa 1922. Courtesy of Library of Congress. I’m currently writing Born of Corruption, the companion novella to Born of Illusion (Balzer+Bray, 6/13) and Born of Deception, (B+B 6/14). Born of Corruption takes place in New York City and is a murder mystery that spans the course of a Scavenger Hunt Party. While Born of Illusion and Born of Deception are both told from the viewpoint of Houdini’s daughter, Anna, Born of Corruption is told from the POV of Anna’s best friend, Cynthia Gaylord, who is the ultimate flapper. Let me just say that I love me some flappers. They were the first truly modern women, shocking their Victorian mommas and papas with their independent, outlandish behavior. One of my favorite sources is a book called Flapper by Joshua Zeitz. It’s one of those history books where the writing is as engaging as the topic. (I love it when that happens!) Zeitz is giving me a whole new appreciation for the flapper, the young woman who dared to have her own job, date whom she liked, drink, dance, and roll down her stockings. Here are a few notable flappers. Zelda Sayre (aka Zelda Fitzgerald): Long credited for being Scott Fitgerald’s muse and the inspiration for Daisy of The Great Gatsby, Zelda Sayre made her parents crazy with her insistence on bucking the rules and challenging society’s status quo. She often snuck out of her Montgomery home to dance until dawn, and when she finally married Scott, they took New York by storm. A savvy marketer, she used their over-the-top, lavish lifestyle to further her husband’s career. Even having two children couldn’t stop her from taking her place as queen of the flappers. Lois Long (Aka Lipstick) was the daughter of a minister, a journalist and a 1920’s party girl. She was only three years out of Vassar when she got an interview for The New Yorker. She lived the life of a modern Jazz Age girl, but had a sharp eye for detail, a sly sense of humor, and a wicked writing style. The New Yorker hired her on the spot do to a lifestyle column for the magazine. Much like the fictional Carrie Bradshaw did decades later, Lois Long drank, danced, dated, partied at all the right clubs, and then wrote about her life for the public’s avid reading pleasure. Her marriage to a fellow New Yorker colleague destroyed her anonymity, but even though Lipstick was dead, Lois wrote at the New Yorker for decades, long after the roaring twenties had been silenced. Coco Chanel: The woman who would change the way women around the world dressed was raised in an orphanage. During school holidays she was sent to stay with distant relatives who taught her to sew. 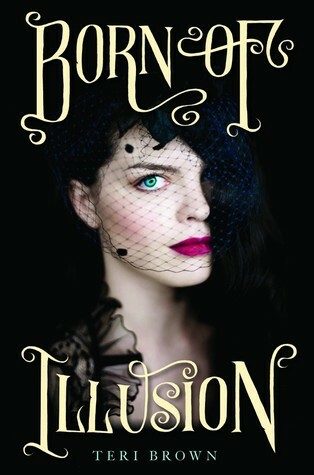 She worked as a hat girl until she became the mistress of a Frenchman who was as unorthodox as he was rich. For two years she frolicked, partied, and raced horses. From him, Coco learned how the very rich lived, and she began to develop her own personal style. At the time, women were becoming ever more involved in sports, and Coco disdained the bustles and corsets that hemmed them in, instead dressing like a man in riding boots, jodhpurs, and ties. The clever and well-made hats she was making were soon in great demand from the rich women attending her boyfriend’s parties, and before long she had her own little hat shop in Paris. It was the beginning of the House of Chanel. These are just three of the many flappers who helped usher in a new era for women. They worked as hard as they played, but women today owe a great deal to their tenacity and their insistence on person individuality and the freedom to make their own choices. A gifted illusionist, Anna assists her mother, the renowned medium Marguerite Van Housen, in her stage shows and seances, easily navigating the underground world of magicians and mentalists in 1920s New York. For Anna, the illegitimate daughter of Harry Houdini—or so Marguerite claims—handcuffs and sleight-of-hand illusions have never been much of a challenge. The real trick is keeping her own gifts secret from her mother: because while Marguerite’s power may be a sham, Anna possesses a true ability to sense people’s feelings and foretell the future. From Teri Brown comes a world bursting with magic, with romance, with the temptations of Jazz Age New York—and the story of a girl about to become the mistress of her own destiny.